What we saw at Old Trafford on Tuesday showed why Juventus can win this season's Champions League, and why Manchester United won't. There was a huge gulf in class between the two sides - United are 10th in the Premier League for a reason, while Juve are one of the best teams in Europe and have got everything you need to be successful. The Italian champions have got a good goalkeeper, two full-backs who are like flying machines, and two rocks at centre-back - who probably form the best defensive partnership in this season's Champions League. They have control and composure in midfield, as well as somebody like Blaise Matuidi who is willing to do some of the donkey work, and then there is the brilliance of Paulo Dybala and Cristiano Ronaldo up front. Go right through their team and it is as complete as any other in the Champions League this season. Juventus are so good, I don't just believe they have an excellent chance of going far in the competition, I actually think they will win it. For me, they are the team to beat. Maybe they do not play beautiful football at all times but they know how to score, how to defend, and also how to see out games. On top of that, they have got Ronaldo - a star player who always delivers, and someone who will win you things. They signed him from Real Madrid in the summer to bring them the Champions League for the first time since 1996 and Tuesday night was an example of why that decision can pay dividends. People were wondering why Dybala had so much space in the first half, but it was because United concentrated on stopping Ronaldo. His presence alone meant that, when the ball came near the box, defenders were marking him or watching him. That left Dybala spare on several occasions, not just when he got the winning goal. For the first 60 minutes, Juve's forward players were sensational with their movement and the positions they took up, but the Italian champions also defended brilliantly in the closing stages. At no point did Juve ever lose their composure, or their class. Player for player, I thought they were the stronger team when I looked through the line-ups before kick-off and no amount of effort by United could bridge that gap in quality. To hurt the really big-hitters you need quality and magic in the final third and, on Tuesday, United had none. They hardly ever got any kind of service to their top three, and when they did, never looked like creating a clear-cut chance. Paul Pogba hit the post out of nothing, but there was never a moment in the whole game where I thought United were going to score. Mourinho was right to praise Giorgio Chiellini and Leonardo Bonucci afterwards because the Juventus defenders put on a masterclass. By the end, United's players were probably thinking it was pointless to play the ball forward, because those two were always there to clear any danger. Juve were on a different level, but there were some positives for United - there was no issue with their effort, their togetherness or their spirit. Yes, they were well beaten, but it was not for the want of trying, any lack of a team ethic or because their players were unwilling to put their body on the line. Against Juve, I saw the same determination that United showed in coming from behind to beat Newcastle and draw with Chelsea, but they were just short of that little bit of quality they needed to do the same against a very good team. That's why I don't think you can be too critical of United - I tried not to be too negative in my commentary on BBC Radio 5 live - and you just have to say they have been beaten by a better side. Sometimes you have just got to accept it when that happens, rather than looking for someone to blame. Pogba is usually in the firing line whenever United lose but this defeat was not his fault. He had United's two best efforts at goal and showed glimpses of his passing ability, but he spent most of the first hour of the game protecting his back four, going from box to box and staying on the move. By doing that he showed the kind of discipline people have been demanding from him - and I actually think he did the same against Newcastle and Chelsea too. Romelu Lukaku has now gone eight games without a goal and his performance against Juventus was questioned afterwards. But if you want to know why he did not do too much on Tuesday, you have to acknowledge the calibre of the centre-backs he was playing against, and also ask if he got the correct service - and no, he did not. I cannot remember a clear chance coming his way versus Juve, or against Chelsea at the weekend either. Of course he has to do more for himself, because in United's situation they needed their forwards to win them the game in the same way Ronaldo and Dybala did for Juve. But you could say the same about Anthony Martial and Marcus Rashford, who also did very little. I do think Lukaku's levels have dipped a little bit, especially when you compare him to the player we saw at the World Cup in Russia. But I don't see any other options for United up front to lead the line like he does. He is a player I think they have to persevere with and hope comes back into form. Mourinho is still getting criticism himself of course, but I said before the game I think United should stick with him, and this defeat does not change that. United have now won only one of their past seven games but I don't think it is a crisis situation because the players have given everything and, if they play at the same level as against Newcastle and Chelsea, their Premier League results will improve and they will get out of their Champions League group. 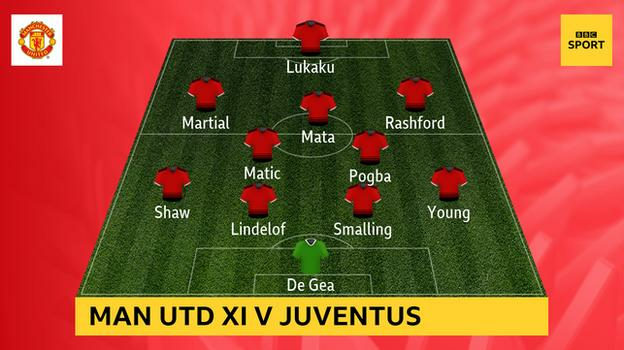 The fans have to accept any manager in charge of this United team would probably have been beaten by Juventus, so Mourinho just needs to be allowed to get on with it - starting against Everton on Sunday. It is important United respond strongly this weekend because they have to start climbing the Premier League table. 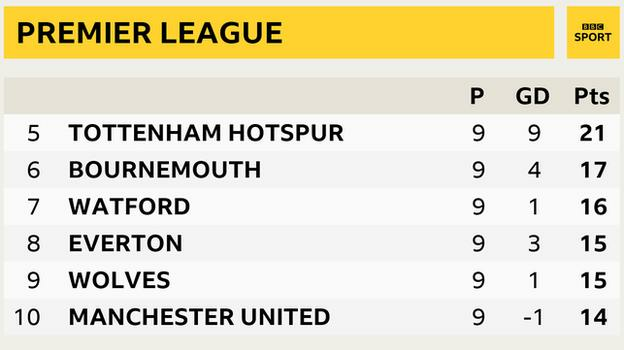 Getting fourth place has to be their focus now because they are not going to win the Premier League or the Champions League, and they need to concentrate on getting back into it next season. Phil Neville was speaking to BBC Sport's Chris Bevan.